posted on Apr. 11, 2019, at 9:31 a.m.
Editor’s Note: After a 1998 spinal cord injury left Rosemarie Rossetti paralyzed from the waist down and in a wheelchair, she and her husband needed to build a new home to accommodate her newly compromised mobility. They founded the Universal Design Living Laboratory in Columbus, Ohio, where they’ve been living since 2012. This article is part of a series in which she describes the journey and employing universal design/Living in Place features in the house they built. In the Universal Design Living Laboratory, the power room features a pocket door to hide the toilet from view, a vertical toilet paper holder for easy replacement and a phone at an accessible height. In 2010, my husband, Mark Leder; our interior designer, Anna Lyon, and I drove to Cincinnati to meet with Chris Rose, CEO of the Rookwood Pottery Co. We had the floorplans of our home with us and were discussing the design of the 8-foot by 8-foot-6-inch powder room. Lyon did not want visitors who entered our front door to be able to see the toilet in our powder room, which was located near this entry. Discussion centered on a way to shield the toilet from view of the adjacent front foyer. After many sketches, our design team came up with a totally unique and innovative idea. 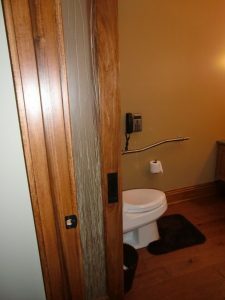 Install an interior pocket door on the right side of the toilet that would serve as a screen when it was extended. This pocket door could be pushed into the wall when more room was needed. This would enable a person who needed this space to accommodate a wheelchair, or for a person assisting them to transfer on and off the toilet. The floor-to-ceiling, 30-inch-wide interior pocket door is made of a poplar wood frame with a translucent resin door panel embedded withBear Grass. The hardware to slide the door is installed in the ceiling, allowing for smooth entry. As a person who uses a manual wheelchair due to a spinal cord injury, I am keenly aware of the considerations that were taken into account during the design of our powder room. A 33-inch-wide knee space under the sink and a mirror hung at 40 inches above the floor accommodates a person in a wheelchair. recirculation system so hot water is prepared to come out of the tap within 10 seconds of turning it on. A phone is mounted on the wall next to the toilet, making it easy to answer and place calls. This phone is connected to all the phones in the home, so it also serves as an intercom allowing throughout the house. An LED night light installed in the wall is continuously illuminated. The toilet-paper holder is mounted vertically, making it easy to change the roll. The powder room is beautiful and fully functional. The vessel sink is positioned on the countertop, which is covered in small brown glass tiles. The wall behind the sink has a few of these glass tiles installed to accent the slate tiles. 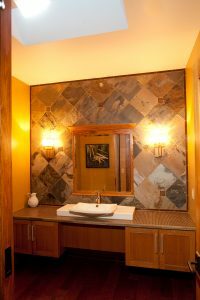 Visitors to our home often comment about the powder room. It is welcoming and accommodating to all our guests. Rosemarie Rossetti, Ph.D., is an internationally known speaker, trainer, consultant, and author of the Universal Design Toolkit. The Universal Design Living Laboratory, located in Columbus, Ohio, is the top-rated universal design home in North America with three national universal design certifications. To purchase the Universal Design Toolkitat a 50% discount go to:www.udll.com/nkbaTo get a free chapter, take a virtual tour, and learn more about her national demonstration home and garden, the Universal Design Living Laboratory, go to www.udll.comTo contact Rosemarie and learn about her speaking, training, and consulting services, go towww.RosemarieSpeaks.com.